The name of this organization shall be Little Egypt Grotto (hereafter referred to as LEG or the grotto). This organization is a member of the National Speleological Society, (hereafter referred to as the NSS). This organization is a not for profit organization. 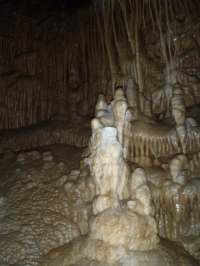 The purpose of this Grotto shall be the same as that of the National Speleological Society which is to promote interest in and to advance in any and all ways the study and science of speleology, the protection of caves and their natural contents, and to promote fellowship among those interested therein, with the additional purpose of organizing cavers in Southern Illinois to better promote the objectives of the NSS. A. The Little Egypt Grotto shall be governed by an Executive Board (hereafter referred to as the Board) made up of the following officers who are current regular members of the NSS and are regular, lifetime or family members (who are greater than the age of 17) of the grotto and have been duly elected annually by the grotto membership. B. The Board’s purpose shall be to manage the business and finances of the Little Egypt Grotto; to formulate by-laws and policies in a manner consistent with the policies of the NSS; to perform all other necessary operating functions, as deemed appropriate. C. Decisions or actions of the Board may be overruled by 2/3 majority vote of the grotto membership. D. All Board members have equal powers. A. The general meetings shall be held at a time and place determined by the Board. B. Board meetings shall be held at a time and place determined by the Board. C. A petition signed by a majority of the current voting grotto membership shall require the Board to call a special meeting for the purpose stated in the petition. The constitution and by-laws of the NSS shall be binding in this grotto. Any action inconsistent with the NSS shall be null and void. Any NSS property held by this Grotto shall revert to the NSS in the event of dissolution of the grotto. A. To be eligible for a board position, one must be a current regular, lifetime, or family member who is both an NSS member, greater than the age of 17 and a grotto member, either regular, lifetime or family member for a minimum of one year prior to the current year. B. The Board shall be elected by a majority of the current grotto membership who are eligible to vote and are present at the date of the election. 1. Must be a current regular, associate, lifetime or family member who is greater than the age of 17. 2. Must have been a regular, associate, life time or family member of the grotto, for at least one year prior to the date of the current election. 3. Must be present at the time and location of the current election in order to cast a vote. D. Nominations shall be held at the last meeting in November. Elections shall be held at the first meeting in December. The new Board shall take office the first meeting in January. Only those eligible to vote may make nominations for election of officers. E. Any Officer may be removed from office by a 2/3 vote of the membership at the next regularly scheduled meeting following a properly seconded motion by any grotto member. F. A vacancy exists when a Board member resigns or is removed from office, prior to the completion of the one year term which he/she was elected to fill. A special election shall be held to fill a vacancy, with the exception of the Chairman position. The Vice Chairman shall fill the vacancy of the Chairman. In which case, a vacancy exists in the Vice Chairman position. Nominations are to be held the first meeting following the known vacancy. Election for the vacancy shall take place at the meeting following the nominations. The newly elected individual shall take office at the next regularly scheduled meeting following the vote. Members who are eligible to vote must be present at the date and time of the election to cast a vote. Amendments to this constitution shall be made by presenting the proposed amendment to the Board. The Board must approve the proposed amendment by a 2/3 vote. The approved proposed amendment shall be presented in writing to the current membership who are eligible to vote in elections of the grotto who shall be given two regularly scheduled meetings to consider the amendment. Approval of the amendment shall be by 2/3 of the eligible voting members who are present at date and time of the vote. Amendments will be filed with the current Constitution and Bylaws of the Grotto and in the Grotto Library. All other Constitutions shall be considered null and void upon the approval and acceptance of this Constitution.